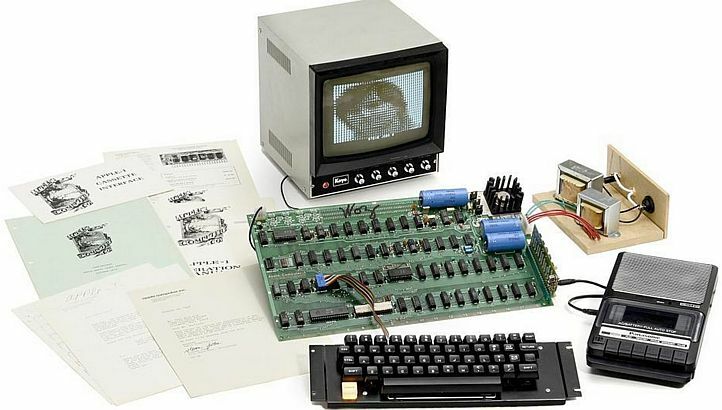 The Apple-1 went for a bargain $112,000. A rare functioning Apple-1 computer has sold for $112,000 at auction in Berlin — considerably less than the predicted $200,000-$334,000 auctioneers expected it to fetch. Given that, in 2014, another Apple-1 computer sold at auction for an incredible $905,000, it’s proof positive that the spike in Apple-1 prices which followed Steve Jobs’ death is most likely over. “From our point of view we are back at normal levels. Five years after the death of Steve Jobs the ‘hype’ has settled back”, Uwe Breker, who oversaw the auction in Cologne, told News24. The Apple-1 being auctioned over the weekend previously belonged to engineer John J. Dryden, who bought it back in 1976. It still had its original receipt, operating manual, and other documents. It was bought by a fellow engineer in Germany, who collects old computers. The Apple-1 was released in April 11, 1976. Designed and hand-built by Steve Wozniak, with Steve Jobs handling the (limited) marketing, it was funded through the sale of Woz’s HP-65 calculator and Jobs’ VW van. Only around 200 Apple-1 computers were ever sold, primarily through the Byte Shop, one of the first personal computer stores, which was on the lookout for product. Today, just 63 Apple-1 computers are thought to still survive, and only 15 of these are documented as having worked since 2000. If you haven’t got six-figures to drop on an old computer, however, but would still like to get a glimpse at the Apple-1, there are a few places you can see one on display in the U.S. — such as the Living Computers: Museum + Labs in Seattle.